Kathryn Hoffer, a violinist and graduate of the Eastman School of Music, has enjoyed a successful 45-year career as a music educator in school orchestra and private studio settings. She is currently the music director of the Society of Strings, an orchestra for amateur adult string players, as well as the orchestras at Hiland Mountain Correctional Institution. She serves on the faculty and board of the Alaska String Camps and is adjunct faculty in the University of Alaska Anchorage Music Department. Ms. Hoffer was honored as the Alaska Music Educator of the Year by the Alaska Music Educators Association. Also in 2002 she was named a BP Woman of Achievement. She was the recipient of the Individual Artist Award in the Mayor’s Arts Award program. In 2010 she was honored with the American String Teachers Association’s Elizabeth A.H. Green School Educator Award. In 2003 I was looking for an orchestra as a beginning cellist. Six years later I am still playing with the Hiland Mountain Correctional Center women. We have a nonprofit – Arts on the Edge supporting the program along with a very generous local community of musicians and loyal concert attendees. We have committed orchestra teachers, and focused, dedicated inmate musicians. Our annual concerts are now attracting well-known musical artists to provide ‘star power’. Our program survives on $10,000 per year most of which is generated by the annual concert ticket sales. With twenty two members, that is $454 per member per year!! Thank you for your continued support! 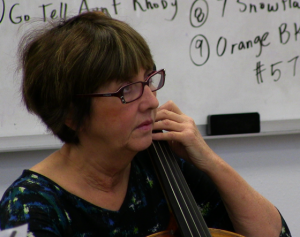 Joy Sharpe retired in 2003 after teaching orchestra in the Anchorage School District for twenty-one years. Principal assignments included West High School, Gruening Middle School, and numerous elementary orchestras. In 1999 she was honored to receive the Alaska Outstanding Music Educator Award. Joy played violin in the Anchorage Symphony Orchestra for over ten years and has participated in several chamber music ensembles. Since retirement she has been a member of the Anchorage Concert Chorus and has enjoyed tours to Russia, Europe and Canada with that group. She continues to support her interest in string music education by actively serving on the Board of Alaska String Camps, Inc. and by teaching at Hiland Correctional Center. At Hiland she is also involved in Parenting Classes with the inmates. 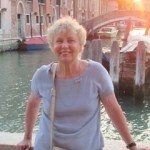 She feels that she is qualified to do this because of her forty-five years of experience with her own two children and five grandchildren. She is a liturgist in her church and leads a small group Bible Study for women. Joy is married to Jon Sharpe.